Host your event in our expansive outdoor property under the beautiful arbor shaded by wisteria where we can accommodate up to 300 guests, or use the spacious “Great Room” with floor to ceiling windows to handle your special indoor event with up to 80 guests any time of year. For smaller weddings, 50 or less, huddle by the shore of Clear Creek or maybe you’ll just pick a spot in the enchanted Wonser Woods. Breathtaking views, award winning wines, and our intimate Inn is the perfect setting to create memories of a lifetime. 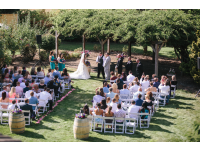 We have just added an expansive indoor/outdoor Event Center that will now allow for year-round weddings. 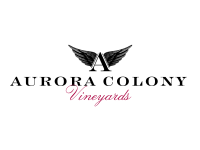 At Aurora Colony Vineyards, we pride ourselves on not only offering a picturesque setting for special events, but also providing exceptional service both before and during events. 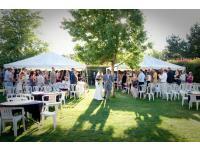 Our multiple indoor and outdoor venues on the property offer picturesque backdrops for any event. If need one venue or a combination of venues, we offer packages that can easily accommodate 40 to 600 guests! Contact us for booking your wedding! 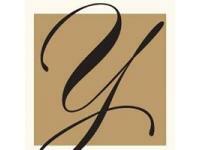 Oswego Hills Winery is available for use throughout the year for various wine events. Please contact our hospitality coordinators or the director of catering for more information regarding your needs. We look forward to working with you or your group. 5510 NE Breyman Orchards Rd. Enjoy the European flavor and hospitality in our two inside event rooms, fountain courtyard area, natural spring-fed lake and three tiered amphitheater, or the new crush-pad patio. The possibilities are limited only by your imagination.